What grade is a pull up? As part of writing the guide I will have to spend a good bit of time thinking and talking about grades – whether I like it for not. Grades are a nessacary evil. Their purpose is to indicate problems which one might have a reasonable chance of success or an entertaining failure. However they have become a proxy for a lot of other things. What grade is a two armed pull up? Surely for such a simple movement we could easliy reach a consensus and if we can’t what hope to we have for a boulder problem that requires multiple complex movements. Gradewise I would say a two arm pull up is around 3+ and a one armer is around 7a. But its a pointless question really. Maybe the more variables their is the more likely the grade is to be accurate. For example for a pullup no amount of technique or height will make it easier. If a long problem has one move a bit harder than the rest this will have less effect on the overall difficulty than if this move was the only one. 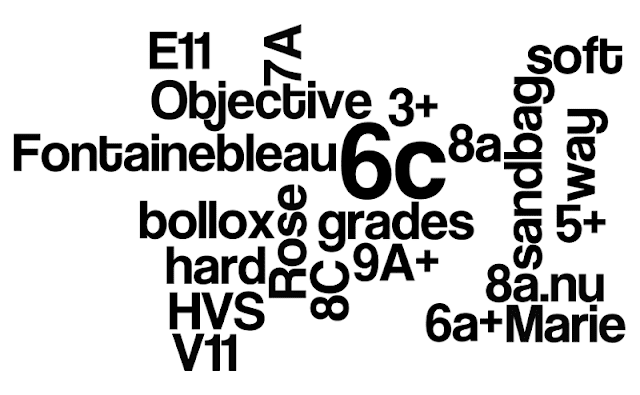 Basically I’m just saying that grades are a load of bollox. 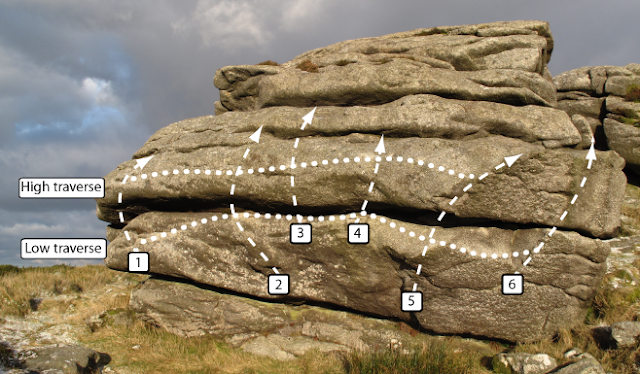 The web version of the bouldering guide has very few photo topos ie. photos of cliff or boulders with the lines of problems superimposed on them. There were a few reasons for that firstly if the guide was printed in low definition black and white on an ordinary printed most topos would be unreadable, secondly they take up a lot of space and the guide would be huge if they where used extensively, thirdly they tend to be more suited to steep cliff band type climbing rather than rounded boulders (ie. it could take 4 or 5 photos to show all aspects of one boulder) and we don’t have much of that kind of thing and fourthly I don’t really like them. Having said all that I think there might be some in the new guide. Here’s one of the Second boulder on Three Rock, I think it looks smart enough and shows the lines pretty well. What do people think? Please comment. The plan is to do the guide is three phases, firstly the dublin area, secondly the wicklow area and thirdly the rest of the country. At the moment I’m not really able to travel much so this way makes sense. Plus if I find the task of doing the guide to the whole country is too much I could just do a Wicklow guide but I really don’t think it come to that. Format wise the book will be landscape about a5 which seems pretty standard for most modern bouldering guides. The plan at the moment is for the topos to be black and white, for some reason any I have done in color just look very amateur. The layout will be pretty minimal and straightforward allowing me to contrate on the words and photos. I want to get a really wide variety of photos, some historical ones, nice landscapes and as many as possible that haven’t been seen before. Toolwise I use Adobe Illustrator to draw the topos and Adobe Indesign to lay it all out. Have used Illustrator for a few years but am learning a lot more recently. Indesign is all new to me but by the end of the year I should be pretty handy with it. TheShortSpan is 10 years old soon. I can’t remember its birthday but it was some time before the end of February 2000 Check it out on archive.org here and here. This website started off with some very scant information about bouldering in a few obscure spots in Dublin and Wicklow. It grew as bouldering become more popular. As areas became discovered and documented new web pages were created with some fairly crude topos. A few years ago it became apparent that having the topos spread over many – difficult to print – html pages was not the way to go, the answer was to assemble all the information from the web pages into one document. The first edition of the guide was 50 pages and it has grown to 123 pages in the latest and fifth edition. The updating of the guide has been my main focus and so the rest of the site hasn’t been updated with articles, news and photos as much as it might of otherwise. As the guide got bigger it took more and more time to update and the gap between updates started to get larger. 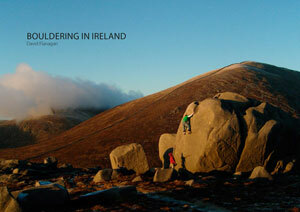 I have decided to publish a printed guide to bouldering in Ireland. 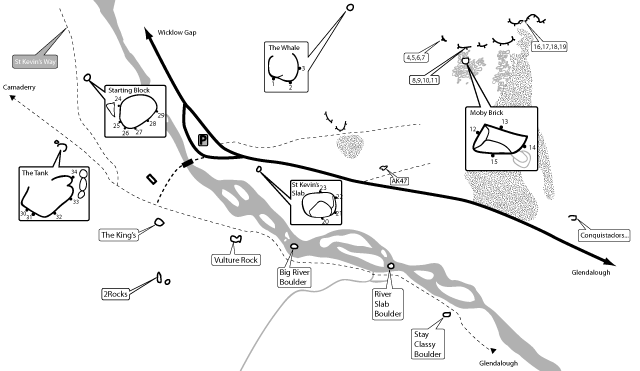 The information contained in the web guide will be the basis for it but the print guide will have loads of photos, everywhere will be re-research and the topos and maps will all be redrawn. Over the years a good few people have encouraged me to do a print guide and I always felt the time wasn’t right so what has changed? From a personal point of view I now have time on my hands and I felt if I don’t do it now I never will. Also the rate of discovery of new bouldering areas has slowed down so there is less risk of the guide being out of date before its printed. At this time I hope to have the guide ready for Christmas. This may be too ambitious as I have never heard of a guidebook meeting its deadline. Guidebooks are expensive (€25 seems to be about average), I will do everything I can to keep the price of mine as low as possible for two reasons firstly I want to sell as many as possible and secondly this isn’t a money making exercise for me. Once the print guide is finished I will be taking down the web based guide but it will be freely available until then so no panic. I will be looking for as much feedback as possible. I really want to hear from people about what they would like to see in the guide. Also feedback on the information in the existing guide would be very helpful. I would especially be interested in hearing from anyone who has any good photos so please get in touch. To make all this easier I have started a blog to keep people up to date on my progress, I will use it as a sounding board, I will post up previews as I go along and hopefully there will be some useful insight into creating a guidebook.